If you watched the news in August—particularly the 24-hour cable news outlets—the chances are excellent that you were watching reports, panel discussions, commentaries or town halls regarding the presidential election, now just over 70 days away. 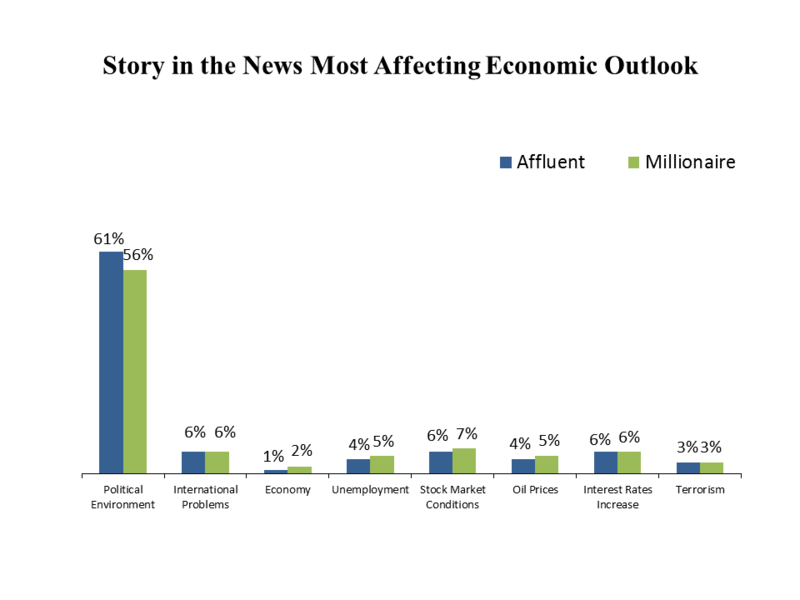 What is the impact of this barrage of seemingly non-stop coverage on Affluent investors’ mindset?Spectrem Group surveyed Affluent investors in August about what news stories are most affecting their economic outlook. Sixty-one percent said the Political Environment. Like most everything about this presidential race, that is unprecedented in the more than decade-long history of this survey. In May 2016, when this question was last asked, 50 percent of Affluent respondents indicated that news stories about the Political Climate were having the most effect on their economic outlook. That, in turn, was up from 22 percent in February. It is to be expected that the closer to the election, the more heated the campaign, which generates news as the candidates and their surrogates make their final pitches to the public. In November 2014, 48 percent of Affluent investors surveyed by Spectrem Group said that news stories about that presidential campaign were most affecting their economic outlook. In comparison, at that time, 32 percent indicated they were most focused on stories about the looming Fiscal Cliff while a mere 3 percent said news stories about the Economy overall were most affecting their economic outlook. Similarly, in September 2008 leading up to the historic election of the nation’s first African-American president, the largest percentage of Affluent respondents said that news stories about Election Results were having the most effect on their economic outlook in comparisons to stories about rising oil prices, the Economy, the Iraq War and Russia’s invasion of Georgia. With the presidential campaign dominating the news, Affluent investors do not seem as focused on other issues. No more than six percent said that news stories about International Problems, Stock Market Conditions, Interest Rates, Unemployment, Oil Prices, Terrorism or the Economy were most affecting their economic outlook. However, in June, Affluent respondents said they consider the Political Climate and the Economy to be equally serious threats to achieving their household’s current financial goals. These attitudes will likely intensify as the days count down to the election. · Advisors need to reach out to investors to hear any concerns they may have over how developments in the presidential race might affect the market.